Yesterday we saw the Menin Gate as it was before the Great War; the Menin Gate was by far the best known exit from the centre of Ypres during the war but in fact arguably the most used was in fact the Lille Gate, pictured here in a British stereo image in 1919. The Lille Gate dates back to the 14th Century and was so named as it was on the main route to Lille. 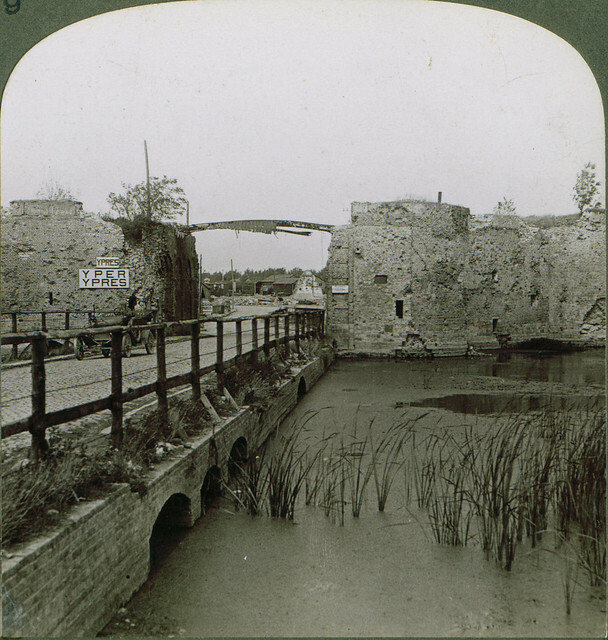 During the Great War the Ramparts close by were used as headquarters – at one stage for Tunnelling units – and there was also medical facilities and a cemetery grew up on the Ramparts itself – one of several on the city walls. After the Second Battle of Ypres in May 1915 the Menin Gate was in direct observation from the high ground around Ypres and so the Lille Gate became the main route to get to the front line for troops passing through Ypres. Today the Lille Gate has been restored and nearby is the Ramparts Cemetery and Ramparts Museum. The ashes of historian Rose Coombes were scattered in the Ramparts Cemetery in the 1990s. This entry was posted on 08/03/2012 by sommecourt. It was filed under Battlefields, Belgium, Great War, Western Front, WW1, Ypres and was tagged with 1919, Flanders, Lille, Lille Gate, WW1, Ypres. This image is so stark and troubling. Yet the survival of the structure at the top of the gate reminds me that some things did survive this dreadful conflict.